One of the many benefits of owning jewelry made with Sterling Silver and Gold (and even metals plated with Silver or Gold), is it can almost always be made to look like new again. 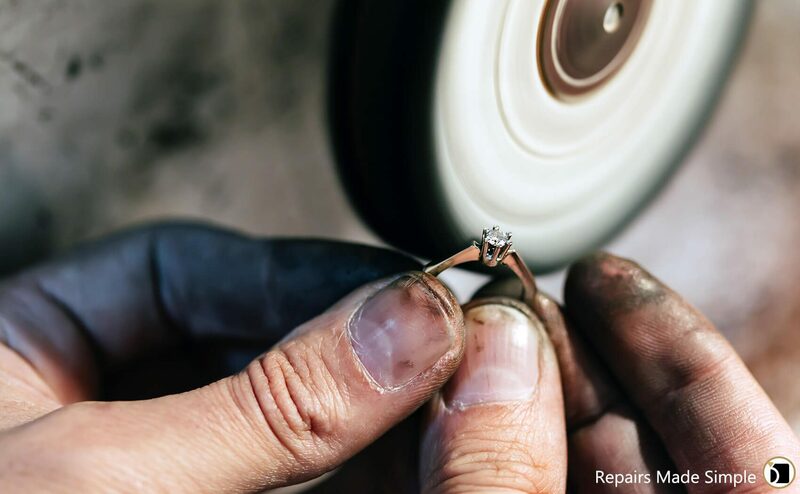 A basic clean, polish, and inspection is part of the routine care and maintenance needed to keep your jewelry looking like new. The inspection process includes looking for loose stones, bent prongs, and any damage to the metal or stones that needs to be repaired. • Step One – The jewelry is buffed and polished to remove any minor scratches. This step will make the surface of your jewelry smooth and shiny. • Step Two – The jewelry is cleaned to remove all the dirt, oil, lotions etc. on the metal and the gemstones. The cleaning process depends on the type of gemstones in the piece. An ultra-sonic cleaner can be used for the more durable gemstones such as Diamond, Ruby, and Sapphire. Gemstones that are more fragile may require special handling and cleaning such as Opals and Pearls. • Step Three – The jewelry is steam cleaned to remove any remaining dirt or cleaning agents. There is a fourth and very important step for many jewelry items and that is the plating process. All White Gold jewelry is Rhodium plated. After the buffing, polishing, and cleaning is done, the item needs to be re-rhodium plated for that bright white finish. Also to note, there are many jewelry items in the market today that are created with sterling silver or brass plated with gold or silver. These items also need to be re-plated after the buffing, polishing, and cleaning is done to restore the finish. Remember… Not all jewelry requires repair, but all jewelry requires routine care and maintenance.